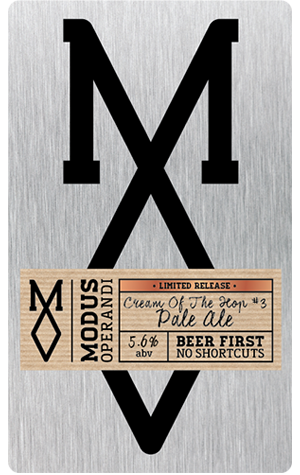 Timed rather nicely for the onset of a spell of warm weather, Modus Operandi have released the third in their Cream of the Hop series. As with previous efforts, it’s built on a wheat pale ale base and has had experimental hops added. The first used the still-in-development Australian hop HPA35, the second used American Azacca and this third builds on that theme, but in a slightly more celestial sense, by using Equinox hops from the USA. Considering it’s a new hop to the people who brewed the beer and those people are from the country from which the hops originate, it’s not one likely to be familiar to many Australian drinkers. The characters you’re most expected to perceive from it are plenty of citrus and, interestingly, a green pepper spice. The latter pepper should be viewed more in terms of capsicum rather than the pepper usually sat alongside salt at a restaurant, so in that regard you’re looking more for a herbaceous character rather than the sharper spiciness you’d expect from, say, a rye beer or saison. That said (and take note home brewers) head brewer DJ McCready reckons Equinox’s pepper character would be a goer in a saison. There’s been some pretty big chatter about the potential of Equinox – Brooklyn Brewery’s Garrett Oliver evidently amongst the fans – so if you want to have a peek at what it’s all about, Cream of the Hop #3 would be a good bet to get ahead of the curve.